Herbert Diess, CEO of the Volkswagen stock company, addresses the media during a press conference in Wolfsburg, Germany, Wednesday, Aug. 1, 2018. 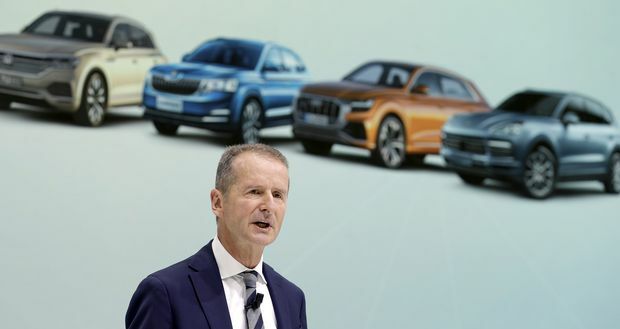 Volkswagen Chief Executive Herbert Diess was told about the existence of cheating software in cars two months before regulators blew the whistle on a multi-billion exhaust emissions scandal, German magazine Der Spiegel said. Der Spiegel’s story, based on recently unsealed documents from the Braunschweig prosecutor’s office, raises questions about whether VW informed investors in a timely manner about the scope of a scandal which it said has cost it more than $27 billion in penalties and fines. Volkswagen’s senior management, which has denied wrongdoing, is being investigated by prosecutors in Braunschweig, near where Volkswagen is headquartered, to see whether the company violated disclosure rules. U.S. regulators exposed VW’s cheating on Sept. 18, 2015. Citing documents unsealed by the Braunschweig prosecutor’s office, Der Spiegel said Diess was present at a meeting on July 27, 2015 when senior engineers and executives discussed how to deal with U.S. regulators, who were threatening to ban VW cars because of excessive pollution levels. Diess, who was VW’s brand chief at the time, became chief executive of Volkswagen Group in April this year. Volkswagen also owns the Scania, Skoda, Audi, Porsche, Bentley, Bugatti, Lamborghini and Ducati brands. The U.S. Environmental Protection Agency (EPA) had found unusually high pollution levels in VW’s vehicles and was threatening to withhold road certification for new cars until VW explained why pollution levels were too high. Diess, who had defected from BMW to become head of the VW brand on July 1, 2015, joined the July 27 meeting with Volkswagen’s then Chief Executive Martin Winterkorn to discuss how to convince regulators that VW’s cars could be sold, a VW defense document filed with a court in Braunschweig in February, shows. Volkswagen on Saturday said both Winterkorn and Diess declined to comment given the ongoing proceedings. Following this meeting, Winterkorn asked Diess whether BMW too had installed “defeat devices” in its cars, Der Spiegel said. In the United States, legal engine management software is described as an “auxiliary emissions device” while the term “defeat device” is used to describe only illegal software. Volkswagen said on Saturday the purpose of the July 27 meeting was not to discuss whether Volkswagen had broken U.S. law, but how to resolve the issue of whether new models would be given regulatory clearance. On July 31, 2015 Volkswagen hired a law firm to help the company understand its regulatory troubles, and lawyers were unsure whether the software would be deemed an illegal “defeat device” in the United States, VW said in the court filing. The court filing further said that Hans Dieter Poetsch, Volkswagen’s finance chief at the time, on Sept. 14, 2015 believed the potential financial risk from regulatory penalties tied to emissions would be around 150 million euros ($172 million). Hans Dieter Poetsch is now Volkswagen’s chairman. Volkswagen on Saturday reiterated that it had not violated disclosure rules and had informed investors in a timely manner about the financial scope of the scandal when it published an “ad hoc” disclosure notice on Sept. 22, 2015. Because the company had already accrued sufficient provisions for vehicle recalls, there was no need to inform investors that profits could take a further hit before September 2015, Volkswagen’s court filing said.